When there is a need in level detection of sinking or floating product in water tanks and wells, you use oil/water interface meters. It is a simple but accurate tool, which is easy to move and operate. The most popular models among all are Heron H.OIL and Solinst Model 122. They both work on the same principles of conductivity and non-conductivity of water and oil, indicating interface between water and non-water liquids by light and sound signal. At first sight, they seem alike, but they have some differences, and both have their own competitive advantages. To compare two models let’s start with things that are similar to both. They detect LNAPLs and DNAPLs, and both give accuracy in detecting oil layers as thin as 1 mm. Both models are provided with a comfortable carrying bag and the grounding lead, cleaning brushes and battery is in the package too. The probes are pressure proof with shock-resistant sensors. There is a tape guide and a hanger, they help to fix the meter on the edge of the well or tank and put the tape in the middle of the reservoir to protect it from damage. Both models perform the marking in both American and European measurement standards (feet/meters). The most obvious differences between these models of oil/water interface meters are in size parameters. The tape in Solinst Model 122 ranges from 30 feet to 300 (10 to 100 meters). 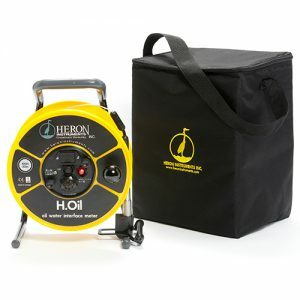 Heron H.OIL has a tape from 50 to 500 feet, and can be provided with tapes even longer. It makes the second model more effective for deeper cisterns and wells, but in the same time, this parameter results heavier weight and less portability. 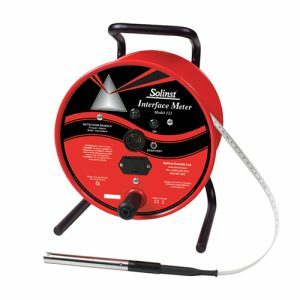 Thus, if your reservoir is not deep and you need to move the meter from one object to another often, Solinst Model 122 will suit you more. But when the well or tank is deep, or especially if you are not sure how deep it is, you should use Heron H.OIL. One more essential characteristic of Solinst Model 122 meter is that its tape is replaceable with tapes from other models. The diameters of the probe in reviewed oil/water interface meters are different, 16 mm in Solinst against 19 mm in Heron. It gives the first model a small advantage if the working aperture is very narrow. Both probes have integral steel shield to protect the beam emitter. Electronic module in both models have a function of automatic shut off. Solinst shuts off after 5 minutes and Heron – after 10 minutes. It helps to save the battery. Heron H.OIL model is certified by Canadian Standards Association (CSA), and Underwriters Laboratories accredited by the American National Standards Institute (ANSI/UL). These certificates are valid in USA, Canada, Asia and Europe. They acknowledge this meter intrinsically safe to use in explosive and hazardous surroundings. Solinst Model 122, together with CSA, is now ATEX certified, EC directive 94/9/ЕС, which classifies this model as an explosion-proof equipment. Two reviewed models of oil/water interface meters have more compatible characteristics than differences. They both are safe, solid, durable and high precision equipment made of longwearing and resistant to all possible damages materials. They are easy to use, portable and handy. When choosing between these two models you need to take into account the depth of your water reservoir and the size of the working aperture. The important factor is also that Solinst Model 122 is certified for usage in dangerous situations in European Union.